2010 features yet another Andrew Podnieks offering with Retired Numbers: A Celebration of NHL Excellence. In this book he looks at all the players who have had the highest team honour possible - the retiring of their jersey number. 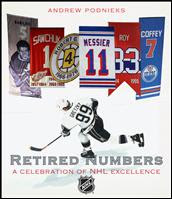 This big book lists all 116 retired honourees in chronological order in terms of the dates of the number retirement. Each player is profiled with a two page spread. Two photos and a very brief career synopsis are included, as is a look at the result of the game played on the jersey retirement night. Most interestingly, and too often too short, is a section reserved for each player talking about the actual retirement ceremony. What special moments were featured, who were the special guests, what was the honouree's response. It is interesting to contrast such ceremonies by era and by franchise. Otherwise the book is a bit of a generic briefing of great players from yesterday, presented in a nice but formulaic format. The book could use some more colour, as there is far too much unused white space for my liking. A small statistical appendix accompanies the text at the back of the book. Interestingly here is where you will find the 15 Toronto Maple Leafs players who have had their number "honoured" rather than out-right retired. The author made the careful decision to make a distinct separation here, although he does not go into any details on these players. "In the storied history of the NHL, many players stand out, and a few become synonymous with their numbers. There are some whose skates are so hard to fill and whose stars shine so bright that their numbers are retired to annals of legend. "In Retired Numbers bestselling hockey author Andrew Podnieks documents 116 players whose numbers have been raised to great heights in arenas across the league. From Toronto Maple Leaf Ace Baily (1934) to New York Ranger Andy Bathgate (2009), Retired Numbers spans the league’s history. From players who made their mark with one team (Paul Coffey with the Edmonton Oilers) to those who starred in many (Wayne Gretzky with the Edmonton Oilers, the New York Rangers, and the Los Angeles Kings), fans will learn just what made these players so memorable. "Packed with photos, stats, stories, and lists, Retired Numbers will delight fans young and old, sparking nostalgia about games gone by and speculation about who will the NHL’s next honoured legends."